As for Miitomo, our first priority was to bring more consumers around the world in contact with Nintendo entertainment. Items are available as in-game purchases for consumers who want to deepen their experience, but we have designed Miitomo so that it is possible to have plenty of fun enjoying this new mode of communication even without making in-game purchases. As a result, users are enjoying Miitomo across the globe, with over 75% of users outside of Japan at present. We expect this percentage to rise even higher in the future as we consider service expansions to South America and Asia. 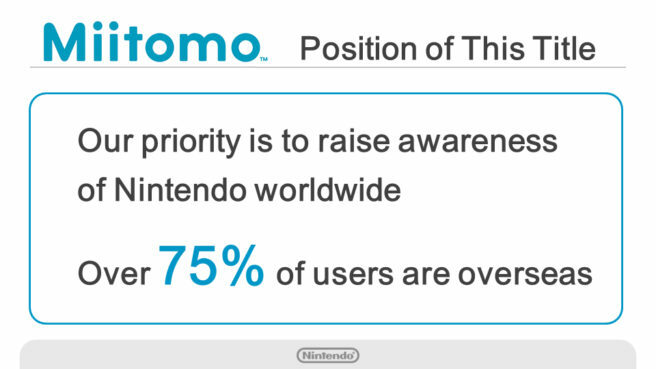 We believe this shows that Nintendo has made real progress in advancing our smart device business on a global scale. We will follow Miitomo by releasing new applications using the Fire Emblem and Animal Crossing IPs globally, and our plan has not changed in terms of releasing around five titles by March 2017.